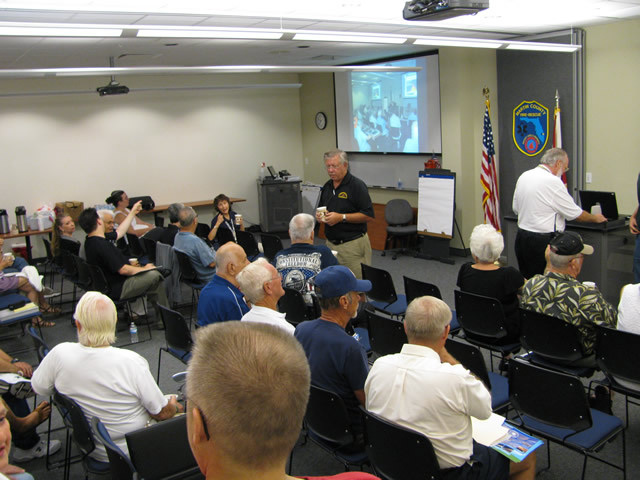 We are invited to a special Saturday tour of the NATIONAL HURRICANE CENTER (NHC) -MIAMI on April 20, 2013. Space is limited to about 20 people. If you plan to attend please sign up here ASAP. If more than 20 would like to take the tour we may have to split up into 2 groups or plan another trip. Please bring a photo ID. The National Hurricane Center is co-located with the Miami National Weather Service Forecast Office on the main campus of Florida International University at 11691 S.W. 17th Street, Miami, Florida, 33165. This location is about 12 miles west of downtown Miami and 8 miles southwest of Miami International Airport. turn south on SW 117th Avenue, and follow south to SW 17th Street. The National Hurricane Center will be clearly visible on your left. We will meet at the Martin County Emergency Operations Center (EOC), 800 SE Monterey Rd at 8:15 AM on April 20th. We depart at 8:30am and travel via the FLA Turnpike to the Sawgrass Expressway. Note: You need to have SunPass toll device in your vehicle- cash tolls are not available in the Miami area. Maps are to be handed out before we leave. If you plan to meet us you should park at the NHC lot. If you plan to drive your own vehicle and are willing to take a few passengers I am sure they will help share some of the gas/toll expenses if needed. The tour of the NHC starts at 11:00 AM and should last about 60-90 minutes depending on Q&A. You are on your own to have lunch at any of the local restaurants. For additional information, please contact Ray Jaworski KI4RHL at 772-485-9677 or via email autopilot9999@yahoo.com. Online registration is encouraged.